And All That Carry On…. – Reimagining life in my 50's. I believe in serendipity, I do. I believe that people join us in our walk for reasons designed by someone other than ourselves. Or so it has seemed in my life. Nearly four years ago, I found myself impotently trying to punch my way out of the stubborn paper bag of depression. The mounting losses had rendered me unrecognizable to myself. Serendipity came then in the form of a powerful woman. I met Maggie Callanan in my driveway. She was a new neighbor, but it was not until she told me she was a Hospice nurse that the familiarity of her name hit me over the head. 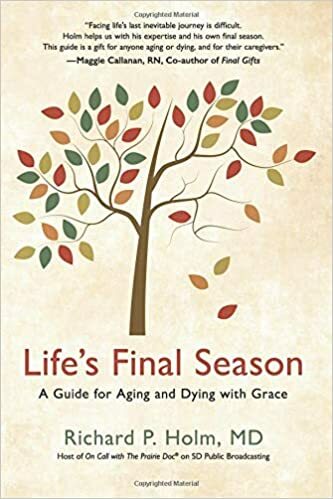 Maggie could not know then that seven years before someone had given me Maggie’s best-selling book “Final Gifts.” It was a gift given while my mother lay ravaged with stage four cancer. Nor could Maggie know that three years later her second book, “Final journeys,” would join “Final Gifts” on my nightstand as my father lay dying. I leaned on Maggie when my elderly uncle moved to be near me for the final eighteen months of his life. She patiently counseled me as Uncle Bobby’s health faded, all the while encouraging my writing. Maggie was the only soul who came to sit with me in the dark of-of a July night as I said my final goodbye to my beloved bachelor uncle. Serendipity brought me an unforgettable friendship with a woman who helped me find myself again. Today I want to introduce Dr. Rick Holm, a South Dakotan physician who has committed a significant part of his professional life to care of the aging. He is also known as “Prairie Doc,” as host of a weekly, one hour, live medical questions program on South Dakota Public Radio and a 30-minute live radio call-in show. You might wonder how a fledgling writer from Connecticut comes to know a Prairie-born, Doctor of Geriatrics of significant renown. Serendipity, of course! Rick and Maggie have known each other as distant colleagues in the business of death and dying. In the midst of writing a book about aging and end of life care, Rick was diagnosed with cancer. In an unexpected moment in time, his writing took on deeper personal meaning. Rick reached to Maggie for review of his manuscript. Maggie suggested to Rick that she had a friend who might be valuable in tweaking portions of the book to inject some lyrical prose. Two medical powerhouses and this neophyte writer? Humbled seems too mild a word. These past six months I have come to know Rick Holm through his manuscript. I wish it had been released in time to join Maggie’s books on my bedside table while I cared for the dying loved ones in my life. I now consider Rick Holm a friend. Life’s More Rich as It Nears Its End Dr. Richard P. Holm M.D. I’ve lived a life formulated to live long: eating right, exercising daily and savoring friendships and family. Despite this, I still came down with cancer two years ago. I’ve been treated with chemo, radiation, major surgery and now, with spread to the liver, I’m back on chemo. I’m still here and truly feel blessed and thankful for every day, but you can understand why, lately, I’ve been thinking about death. Loving my enemies has made this easier. As our kids were growing up, I would find myself saying to them ”I will always love you unconditionally, but sometimes I don’t like what you are doing.” We should say that to our enemies, too. Here is the lesson: hate is poisonous, especially to the one who harbors it. Remember what Jesus said (as did Mohammed and Buddha), “Love your enemy.” I believe hating others, even when justified, only destroys us. When angry, we should point the anger at what he or she is doing, not at the person. Use it as propulsion to fight to the tooth for the cause . . . but let go of hate. How is this related to death, you ask? When people ask me how I contend with the prospect of my dying sooner than I’d like, I go right to the opposite of hate which is love. I know it sounds clichéd and unoriginal but the word love embraces the spiritual, inner-warmth I feel when I value the other person (even if he or she is my enemy). Truly valuing others gives more meaning to my time limited life and helps take away the fear of my own death . . . but there is something more. Some say, “One day, you’ll be just a memory for some people. Do your best to be a good one.” That’s not bad advice, but I think the measure of our worth after we die, has less to do with being remembered and more to do with the reflection of our actions in others. It’s that Pay it Forward or that Jimmy Stewart Wonderful Life sort of thing. I believe meaning and purpose comes with the good that we do and how that moves others forward (whether they’re aware of it or not). Our lives are all like a book that becomes more precious as it nears the end, especially by savoring friendships and family, by letting go of hate and by paying good deeds forward. Why waste any time fearing death? “It’s no bad thing to be lost in a fog or at sea. I bought a house. I had no such intention, but in a leap of financial and personal faith, I bought a magical cottage in the course of eight weeks. I have a lovely friend who invited me to dinner at his new home. When I pulled in, I could see warm light from his windows and as he opened the front door, I was drawn in by the character of the place. Old-fashioned charm eeked from every corner. You know that house, the perfectly, imperfect cottage with nooks and crannies and “good bones.” It is the kind of home that suggests history, where you can imagine who may have lived there before. I was surprised by my delight in his fortune. Over dinner and wine, I couldn’t stop myself from distracting our conversation with Tourette-like interruptions, “God, I love this cottage,” “How did you find this great cottage?” and finally, “Can I have your cottage?” He laughed and with the confidence born to him said, “You cannot have my cottage, but I bet I could find you a cottage of your own.” And that’s how this story begins; a lovely friend with an imagination for me that I did not have for myself, and a realtors license. He sent me several listings the following day. I approached it like a shopping expedition that would take years to complete. When I divorced I bought a condominium, and it was a good one. It came with all the perks of condo living: plowing, shoveling, mulching, leaf raking and the safety in numbers. It was a good space and I shared it with a man I loved. It was a wonderful nest for a time. Then it wasn’t. When love takes its leave it’s hard to remember the good of it and so it was with me. No amount of sage burning, Feng Shui-ing, therapy, or kitchen renovation could chase the memories of the unkindness that replaced the love that once filled that space. My thoughts flew to moving far away from its memories. Rhode Island, Savannah, Nashville, or some lovely South Carolina coastal town became my goal. Pack up and go, start again, do whatever it takes to stop the paralyzing memories. It’s been three years since the crash and I still can’t quite shake the memories of what once held such unexpected promise. Good aura was replaced by bad and I was powerless over its hold on me. Those words, delivered across a bar, stuck in my soul. My friends, who stayed with me when I lost myself, could never be recreated. As I painstakingly find myself again, how can I possibly leave them behind? The house my lovely friend presented to me was on Cotton Tail Lane. That’s a good start in anyone’s book. I met him there and as we entered the stone-framed front door I took note of the dormant climbing hydrangea. I walked into the home, built in 1938, and spied the original planked, fir floors and an endless bank of windows through which the sun poured on a chilly November afternoon. The mammoth stone fireplace was also original, though the kitchen and bathrooms were new. The pièce de résistance was a magnificent screened-in south facing porch which led to a deck, which led further to a flagstone patio and a perfectly manicured yard built for a romping labrador. I have a romping labrador who has, for four years, not known the thrill of a leashless romp. Perrenial bushes and flowers, so many of them, had just settled in for their winter nap, but it took nothing to imagine them in the glory of a June morning. It was a cottage dearly loved by its owners. I wanted this house as much for me as for my seven-year-old labrador, Seamus. It’s hard to articulate when something is simply right. I returned to the cottage several times to test my rediscovered imagination and at the same time tame suspected romantic folly. Each visit bonded me to the space. Within two weeks a bid was accepted and before I knew it keys were handed to me. The gravity of being its next caretaker floated like a cashmere cloak about my shoulders. It’s been nine weeks since that serendipitous meal at the home of a lovely friend. It’s a magical place, my cottage; a soul grabbing writers space that at once summons peace and creativity. This morning, I am sitting on a new couch in the center of my tiny cottage. The original, large-paned kitchen windows are frosted from the inside and in the silence, you can hear the creaks of age. When I sweep the floor my mind swirls with thoughts of the summer lives lived here. It thrills me to think that my cottage was born when Franklin Roosevelt was President and Candlewood Lake was just a child of ten herself. If I close my eyes, I can hear the laughter of children and the happy slam of wooden screen doors competing with the hum of cicadas on summer evenings long before I was a thought in anyone’s imagination. Sometimes, it takes a long walk in the wilderness to appreciate the light of open space again. Serendipity and a friend found my next chapter for me. Isn’t life full of unexpected surprises? It’s not really about the tennis, you know. Sure, it’s a healthy hobby over which one might exercise unhealthy obsession. But, on a brilliant, sunny, August Sunday afternoon standing on a hill overlooking a court in Holyoke, Massachusetts, it wasn’t really about the tennis. Six of us had finished with mixed results in the deciding USTA New England Championships match. We were Connecticut, they were Rhode Island. My partner and I dragged our hot, sweaty, aggravated bodies off the court after a humbling loss. We knew our top singles player had done the same in an epic battle. Disappointment in ourselves was soon replaced by hope when we discovered that two of our courts had won. So, there we were, deadlocked with the Ocean State team who sat on that same hill, adjacent to us, no less invested than we in the remaining match. The final doubles court would decide who took the title; which team would advance to National Championships. What a surreal memory. It’s gotta be about the tennis, right? As a team, we all play in a 40 plus league, and too many of us are of an age to play in a 55 plus division. We battle all winter in our local leagues and we are good. So good, in fact, that I can’t remember a year in the last ten that we didn’t qualify for district championships. The summer is a march through playoffs. First one on the block: 55 plus. We are young for that category, most of us still in our fifties, often facing opponents a decade older. Suffice it to say, our mostly older competition took us to the woodshed with great satisfaction. So, forty and over! Surely, that’s our sweet spot, right? On a baking August weekend North of Boston, we failed spectacularly. And of all the unlikely scenarios, the team on the hill, overlooking the courts of Mount Holyoke, could taste a National Championship bid in the ridiculously competitive 18 and over division. I am 5’8 and the exterior of my 55-year-old body looks much the same as it has for the last 20 years. The interior, well…ouch. That would be the ligaments in my right forearm and the interior tibialis of my left leg. I no longer hop out bed. Rather, I gingerly place my feet on the floor and brace myself for ankle stiffness. It takes the morning walk with my dog before I am sufficiently stretched to feel whole again. My sometimes partner, Loretta, is 5’2” on her tallest day. On the court, she is a tiger and plays like she’s 5’10”. We drew a youngster on the playoff journey. A darling 22-year-old named Charlotte. Oh, she was lovely to look at; tall, lean and my first thought was, “What a sweetie.” I wanted to wrap her in a maternal hug. Charlotte, on the other hand, wanted to take my head off at the net with a topspin forehand driven with the kind of power my aging body could never generate. It was all slow motion as she wound up on a sitter and it was obvious that the open court was of no interest to her. The rocket came so fast that I actually ducked and her ball kissed the baseline. While I recoiled myself from a matrix like escape from concussion, sweet Charlotte pumped her fist. I leaned toward her and glared. She looked at me as if to say, “Is there a problem?” I pointed my racquet at her and said, “I am old enough to be your mother and that was not cool.” Charlotte was nonplussed and just games later went after my partner with such force that Loretta’s racquet was knocked out of her hand. Listen carefully… It’s hardly ever about the tennis. As women, we give enormous time and treasure to our racquets and the fuzzy yellow ball. We are lucky to have the time and treasure to do it. We would not do it if it were just about the tennis. It’s about the teammate who methodically took apart a 20-something singles player under the glaring sun on that August day in Holyoke. She had to leave before the final was finished because she has two beautiful daughters and a baby boy, just into his second year of life, who was delivered months prematurely. He has fought mightily through the difficult first year. Ben is well. Lillian had to leave to get to her kids. Her story inspires me. It’s about our Captain, who still waits for her youngest of five to complete high school. In the meantime, with none of the break that most of us hope to enjoy, devotes two days a week to the care of her first grandson. She does it with enormous generosity and love. It’s about finding friends late in life who, without tennis, we might never have met. It’s about what you learn about others in small drips because you carpool together to matches, or sit in hot tennis clubs on playoff weekends, sometimes for hours, waiting for your match to be called. It’s about the glass of wine or beer you share after a match, sometimes in victory and sometimes in defeat. These are the places we learn each other’s stories. It’s about feeling comfortable enough in a group that if you happen to burst into song or dance suddenly, one or more of them will join you. We never let each other look foolish alone. Here’s the thing: When twenty women, all over forty, become a team they share so much more than tennis. Not one of us hasn’t known struggle: illness, heartbreak, disappointment, grief. We worry about our children. If we are lucky, we have elderly parents who need us. Not all of us do. Some of us enjoy wonderful marriages, others lost that gamble and wonder if they are meant to walk this life alone. None of us have a perfect life, but on that tennis court, and in that car, and sharing that drink, we find a place to work it all out. Eight of us stood on that hill overlooking the courts at Mount Holyoke College on a hot August Sunday and poured all our energy toward our teammates who found themselves in a grueling 10-point match tiebreak. They may have hoped, but couldn’t be certain, that their match would decide the New England Championship. As spectators, we were collectively anxious. When Karen and Jill pulled ahead to an 8-5 lead, we could taste victory. All sitting stood up and held hands, as though our communion could will them to victory. They lost the next two points, at which point I barked, “no more holding hands, everyone, back to your original positions!” The team scurried and those who were sitting before sat again. Hands were unclasped and our girls won the final two points. While Rhode Island spectators slumped, we rose, and cheered, and hugged. Several teammates ran down that hill to the court to give the news to Karen and Jill that their victory sealed the deal. Our Captain beamed as though this were no surprise to her at all. And so it was, an unlikely extension of an extraordinary season. Seventeen of us will share an enormous house in Surprise, Arizona the second weekend of October. We will spend time and treasure to compete at USTA National Championships representing New England. It will be our pleasure. Don’t be surprised if the National Championships ends up not really being about the tennis, at all.